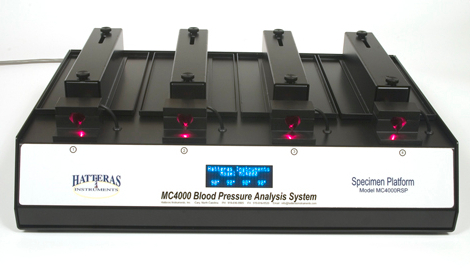 MC4000 Multi Channel Rat and Mouse Blood Pressure Analysis System | Hatteras Instruments, Inc. 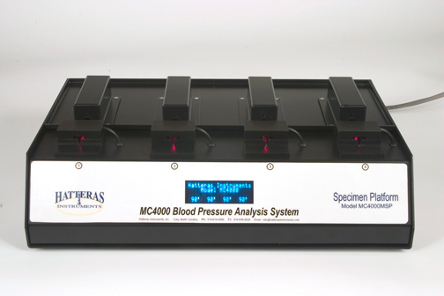 The MC4000 Multi Channel Blood Pressure Analysis System is a non-invasive instrument designed to help researchers efficiently and effectively obtain accurate blood pressure measurements on mice and rats. The specimen platform includes the tail cuff and sensory assembly for acquiring blood pressure results. During a session, the cuff gradually inflates around the tail, so that the animal will not be alarmed into ceasing blood flow. 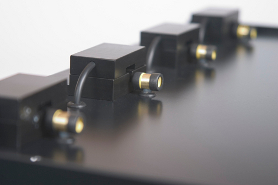 When the platform is powered on, a vacuum florescent display located on the front of the specimen platform continuously monitors the temperature levels of each channel. The sensory assembly includes a custom “V-notch” design to stabilize the tail. The top of the sensor is magnetic for easy removal while situating the animal and quick security once the tail is in place. These two features drastically reduce tail movement to allow for the best results. In addition, the tail cuff and sensory assembly do not require modifications as the animal size increases—one assembly will properly suit all mouse or rat sizes. 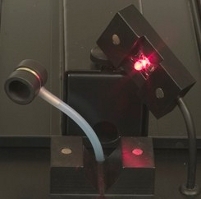 The differences between the MC4000 mouse system and rat system are in the specimen platforms. Most notably, the rat platform, tail cuffs, and sensory assembly are larger with a holder design that incorporates four individual specimen trays. The MC4000 mouse system is smaller with a single, large specimen tray capable of holding all four mouse holders. Hatteras blood pressure systems use different holder designs for mice and rats. Each design is specifically engineered to quickly and safely secure the animal. The speed of restraint allows the researcher to work with untrained animals. The rat holders use front and rear doors that slide and lock into slots located on the specimen tray. The rear door secures the tail, while the front door slides toward the rat adjusting the holder to the animal's length. 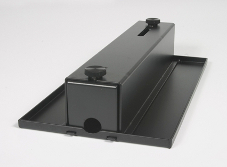 Holders are available in six difference sizes accommodating rats over 1000 grams. The mouse holders include magnetic bases to quickly restrain and position the mouse. Mouse holders come in four sizes accommodating mice over 60 grams. This design is also successful with neonatal rats. 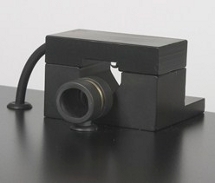 The mouse and rat holders both utilize a specimen tray. 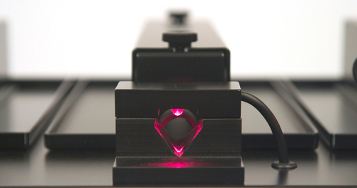 The tray is designed to protect the surface of the specimen platform and simplify cleaning the system. In addition, the tray allows the researcher to easily transfer the animal to the specimen platform from any loading station. The power/utility unit supplies power and air to the specimen platform. 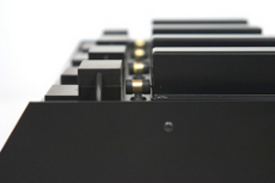 Each unit is designed to accommodate dual four channel specimen platforms. Therefore, it does not require upgrading should the researcher decide to use the MC4000 Dual Platform Operation. The power/utility unit includes a universal power supply so that the system is compatible for international use. The MC4000 is operated through database software loaded onto a PC desktop or laptop. The software initializes measurements, determines measurement parameters, displays the waveforms, saves results, and much more. For more information on the software, please click here. The MC4000 Dual Platform Operation allows one user to work with up to eight animals. By adding a second platform of the same species, the MC4000 doubles the output of results. Or, by adding a platform of the opposite species, one system can obtain blood pressure results on both mice and rats. 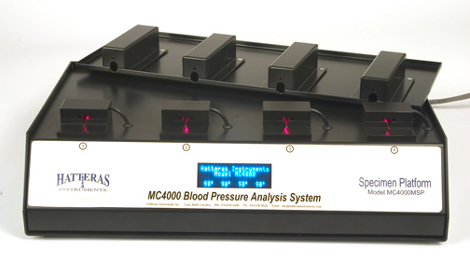 To request a quote or additional information about the MC4000 Multi Channel Blood Pressure Analysis System for mice and rats, please Contact Us. 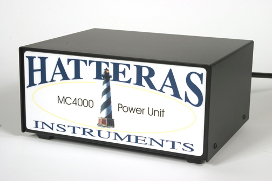 © 2013 Hatteras Instruments, Inc. All rights reserved.